FELIX WHY DID YOU STOP, KEEP RUNNING THE NINE LAYERS OF THE INFERNO ARE WAITING FOR YOU IF YOU STOP RIGHT NOW. This time Felix will land at the bottom of the hole, which will be slowly being filled by water. Dripping drop by drop on his head. And then he will be punished. Is Felix really expecting anyone to be impressed by his cheating? Or indeed, his marginally useful power? Don't get me wrong, if they were looking for a truck substitute, his name would be at the top of the list. But that's not the point of this dealy, they're training them to be magical soldiers. This stunt displays no mastery of the skills they're being taught and is disrupting the lesson. And is it just me or is he displaying some sort of size/weight/mass limit for his carded items? IO dunno, Saiko, I think it's more likely they'll put a port-a-potty on top of the hole they throw him in. That last sentence is one I'm sure Felix will hear many, many times during his training. Chill out, Garth. Felix just backed up your position. Ability to follow instructions is way below that of a common footsoldier. On that note, why is Noah's hair suddenly wet? 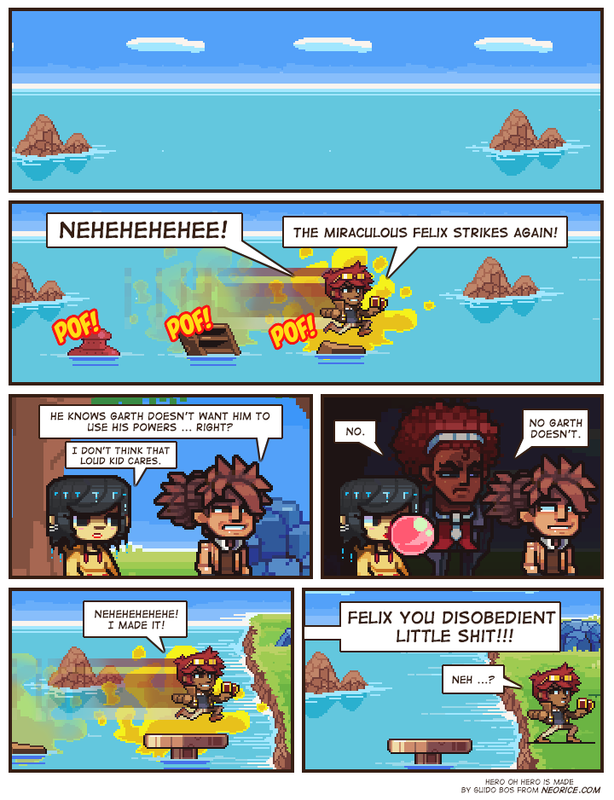 I feel like the Legend of Felixâ¢ is going to be used as a horrible warning for generations. @giovanni: Notice the way the others quailed at Garth's approach? They certainly knew better. @HanMK: It's pretty easy to knock his cards from his hands though, at which point he's ground zero for all of them. Now if he could carry around bridge laying equipment or indeed, a howitzer I'd be more impressed. @orangetree: That isn't Noah, that is Cherry, one of his classmates. She jumped into the river a few pages ago. Garth doesn't wonder, because Garth knows!